Despite the forecast of rain, it turned out to be a pretty decent day. Perfect temperature for paddling (so long as you were wearing booties – the water was cooold) which probably helped boost the numbers. Though the presence of 10x World Champ Jamie Mitchell, who is touring the UK this week, can’t have hurt either. I got my hands on a 14′ Starboard at the last minute and had about 5 minutes pre-race to get used to it. I was so focused on figuring out the intricacies of the boards that I almost missed the start, having to find a spot right on the edge at the last moment. I thought I’d be boxed in against the wall, but that actually gave me plenty of free room as all the elite guys were bunched together in the middle of the river. Paul Simmons shot off like a rocket as soon as the gun went, as you can see from pic above, and held onto the lead for at least the first mile, before Jamie hit another gear and took off on his own mid-way through the first of three laps. After falling off in the first 100 metres and getting stuck in the pack, Ryan James began motoring his way through the field and was in third after the first mile. Ryan famously stuck with Bart de Zwart for 220km in the 2011 SUP 11 City Tour, so if he had’ve gotten a better start and been able to sit behind Jamie, it may have been a different race. I was paddling with Mark Slater for most of the day as we took turns drafting off each other. That was partly to try and catch back up to third, partly to save ourselves from hitting the wall. We were never going to catch the lead guys though, as Jamie, Paul and Ryan gradually extended their leads. Ryan eventually overtook Paul and worked hard to try and catch Jamie, while back in the field most of us were grinding it out and playing defence. The great thing about flat water racing is the strategy and tactics, especially when it comes to wash riding (aka drafting). Straight off the line it’s a battle royale to try and get into a good position. You want to be in the lead pack after the first 500 metres otherwise your chances of winning are over. There’s also no short, sharp bursts of power like in BoP or downwind events, it’s just a long, continuous grind. Combine that with the wash riding tactics and it essentially becomes a mental race rather than a physical one. So for mile after mile we duked it out. The course, set by Race Director (and our resident agent provocateur) Steve West followed a 3.3 mile loop, which mixed things up with plenty of buoy turns and also gave everyone a chance to survey the rest of the field, as we paddled up and down the river. After sparring with each other for a good six or seven miles, I started hitting the wall on the final lap and Mark took off to cement fourth place. I thought I was pretty safe in fifth, with the next chase group of three guys a long way back with only a few miles to go. But then I felt myself getting slower and slower, and despite my best efforts couldn’t seem to find my rhythm. I imagine it’s the same feeling those “escapists” in the Tour de France get. They sprint off early and try to hold off the peleton all day, only to often be inevitably, frustratingly reeled in right before the line. Of course I’d never been in the lead, so it’s not a perfect metaphor. But still, as I looked over my shoulder every 30 seconds to see Pete Kosinski, Pete Holliday and Ollie Shilston motoring towards me in the chase group, I couldn’t help but think about those lonely cyclists struggling up the mountain, looking back, seeing the group gaining ground and just knowing they’re about to be swallowed up. I was having a mental battle: Do I try and grind it out and stay in front of these guys, or slow right down and take a breather, then hop on their tails and cruise home. In the end I went with the latter, as I was about to be caught anyway. I literally stopped paddling, took a drink, stretched a little and then let Pete paddle up past me. Fortunately the Irish young gun (he’s only 16 years old and paddles 75kms per week by himself back home) made a break from Pete Holliday and Ollie Shilston right before the trio caught me, allowing me to hop on his tail and get a free ride home in 6th place. I crossed the line exhausted, both mentally and physically, but satisfied with what was a super fun and very well organised SUP race. In the end it was Jamie first, Ryan second, Paul third, Mark fourth and Peter fifth. Meanwhile in the 12’6 class it was a battle from start to finish between Ollie Shilston and Pete Holliday, with Ollie taking the honours. I could see these guys paddling a hundred metres or so behind me one each lap, and it was giving me a good shot of confidence to know I was beating two of the UK’s leading racers. Of course at the finish I found out they were only on 12’6 boards and suddenly my performance didn’t feel so impressive. Marie Buchanan, who represented the UK at the ISA World in Peru earlier this year, was too strong in the women’s side of the draw and claimed the win. 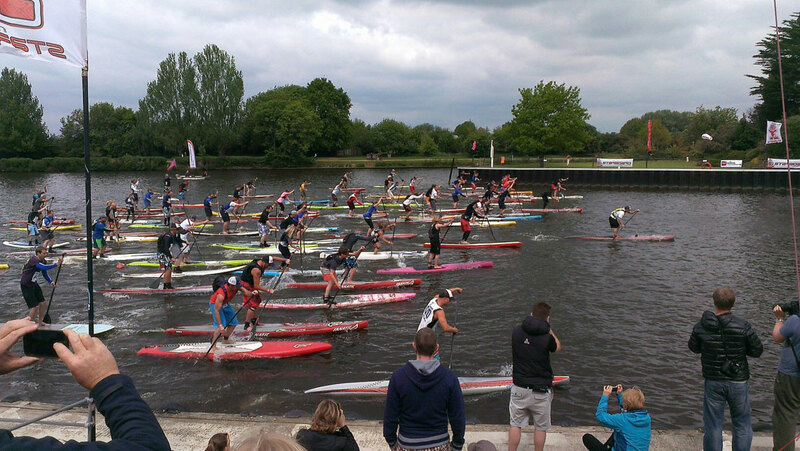 The 2013 Battle of the Thames was a great event, so if you’re in this part of the world in 12 months time I definitely recommend you hop on the river and give it a go. I’ve never spent much time in the UK, so it was an added novelty for me to be racing in a new country.